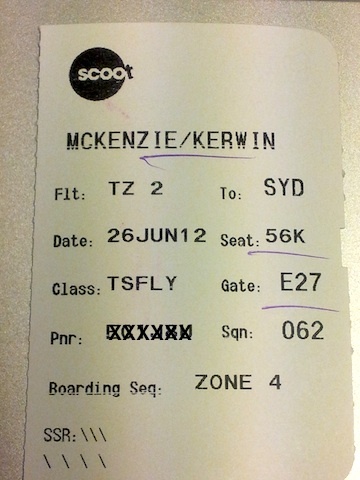 My flight TZ2 (Scoot 2/Singapore Airlines 7712) was at 2:10a on 26 June, 2012, as such, I had to arrive at the airport at about 11:30p on 25 June, 2012. Flights just after midnight are always confusing to passengers as they usually end up going to the airport on the wrong night. 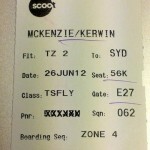 However, having done this before, I was able to arrive at the right time for my very first FlyScoot.com flight. 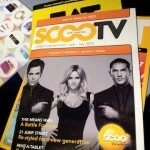 Back on 26 Feb., 2012, I got an e-mail from Scoot that said they were launching their new Web site. I had signed up to receive e-mails earlier that month when I had heard about they starting the new airline. The aviation geek in me took over and I wanted to know everything I could about this new venture from Singapore Airlines. 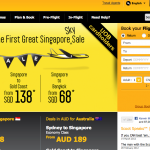 So then on 20, March, 2012, I got an email saying the customers had decided the initial fare to scoot off to Australia from Singapore and it was 88 SGD all in (taxes and surcharges included). I was super excited as they had a good price and I’d get to fly on the inaugural flight. So I went to their web site and after much to do, bought the ticket for travel June 26 to Sydney and return a week later on July 3. I say much to do as there was a few upsells and offers to pre-purchase meals and pay for bags for which I had no interest. On 26 April, I got another e-mail saying that tickets were now on sale for the inaugural flight. What! I thought I was on the inaugural flight? Apparently I was not and the inaugural flight is no w on 4 June. 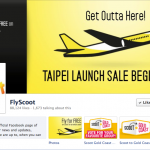 I tried finding an e-mail address for them on their web site www.flyscoot.com, but I was unable to do so. Luckily they turned on the messaging feature on facebook so I sent them a message about it. I tried explaining that the e-mail they sent was misleading and besides why would they not sell the inaugural flight as the first flights out for sale? 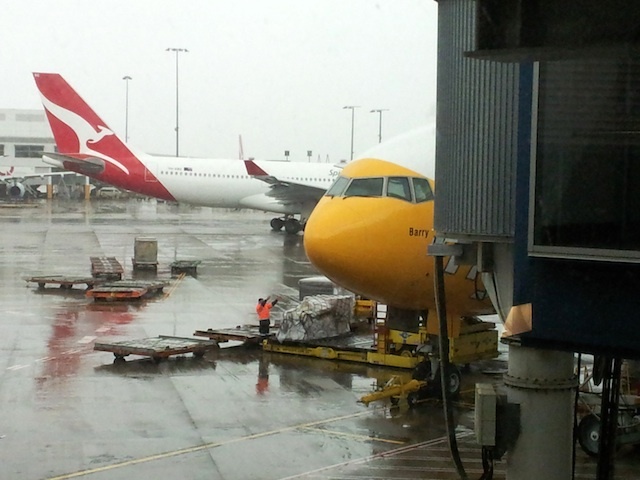 I also pointed out that I had noticed that even the Sydney Airport was confused about the date as I’d read online that they had a banner up with June 26 as the date. There were also other reports that the date had been moved. Another report here. They stood their ground about changes even after I offered to meet halfway and pay the change fee, but not the difference in fare. No worries, I decided to stick with my 26 June date and forego the inaugural flight. As I was early, there were only a few others on the queue, but not too many. While on the queue, an agent approached me and asked for my passport. I asked what he was doing and he advised that he was checking that I had a visa for Australia. I knew I was fine as I’d applied for one back in January when I went to the Australian Tennis Open. My Australian visa is multiple entry and good for one year. I further inquired and found out that if I’d not had a visa, they would send me over to the Singapore Airlines Customer Service counter and I’d have to pay 50 SGD for a visa. Or I could log on to the Internet and apply for it, if I was one of the countries that can apply online. 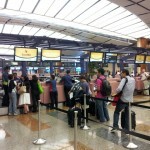 Internet access is free in the airport as long as you get a code by showing your passport from the Information Center. The visa verification agent, Joanne, placed my passport on the counter when she was done, the roaming agent retrieved it, gave it to me and then told me to go see the agent, Jennifer, who was right next to the visa verification agent. I remarked that it was really silly to do that when the visa verification agent could have just given the check-in agent my passport and called me forward. The roaming agent agreed. The check-in process was a breeze; the longest time was spent by me trying to get a seat with no one next to me. 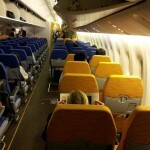 Extra legroom seats varied in cost, going to as much as 99 SGD and as low as 30 SGD. I opted to stay with my cheap normal seat. 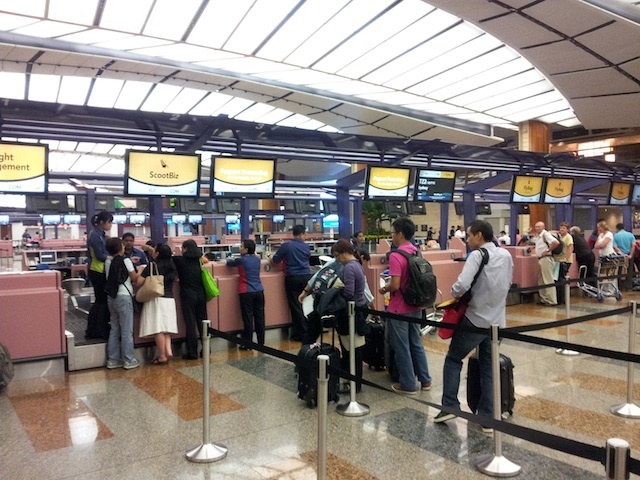 Armed with my boarding pass, I walked over to the Singapore Airline customer service counter. I asked them if I could use the Singapore Airlines Lounge with my United Club card and my Scoot ticket and they advised no. That’s only possible with a Star Alliance member ticket they all said. I thought it a tad confusing for frequent flyers who would fly Scoot and are Star Alliance Gold members or members of other Star Alliance Lounge programs. 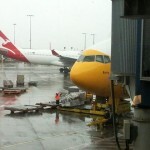 The agents agreed that it was confusing, but stuck to their guns that Scott is Scoot and Singapore Airlines is Singapore Airlines and Scoot is not a Star Alliance member even though Singapore Airlines codeshares on the Scoot flight. As I needed Internet access, I went downstairs to the Information counter, showed my passport and received a code and logged on. Next I headed back upstairs, went through the immigration formalities and entered the terminal. This terminal is pretty big and has so much to do. As I could not use the Lounge, I wanted to find a place to plug in close to my gate. I found some seats just outside of the secure area and made myself comfortable as select seats had a nearby electrical outlet. 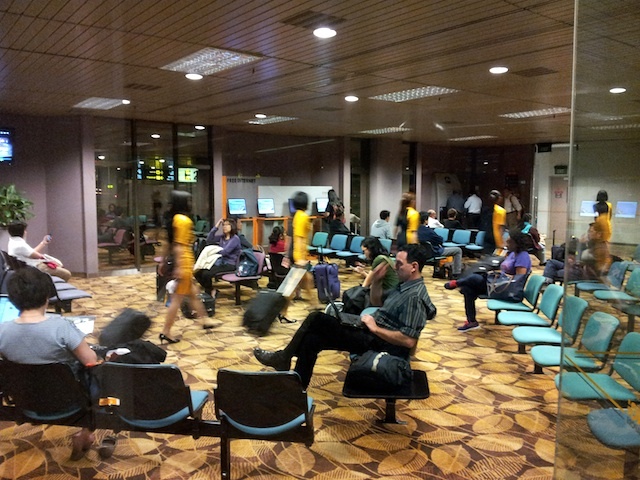 I sat there until about 30 minutes before they started boarding, then cleared the security area. The crew passed by in their black and gold two-tone uniforms; nine flight attendants and I believe two pilots. This is actually done at the gate to the flight and just prior to boarding. This was easy and I did not have to disrobe, just take out my computer and that was it. 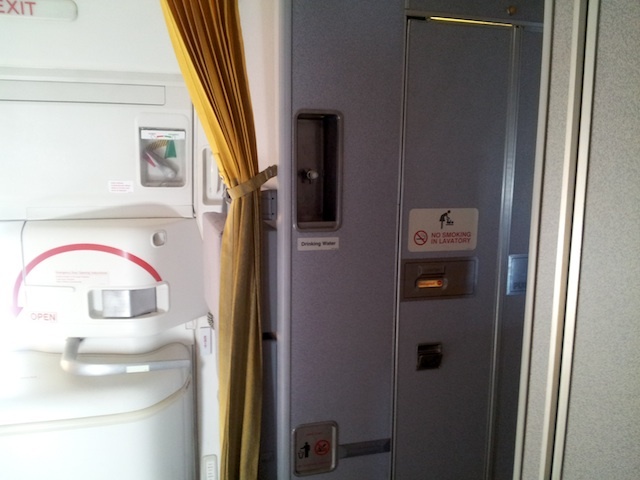 I sat close to the boarding door as that’s where the electrical outlet was situated. The boarding passes have zones, I was zone 4, but they just board the premium seats first and then the back cabin and they are done. Pre-boarding did start at 1:28a with some very groggy passengers. By 2:02a, we were all onboard and ready to go. 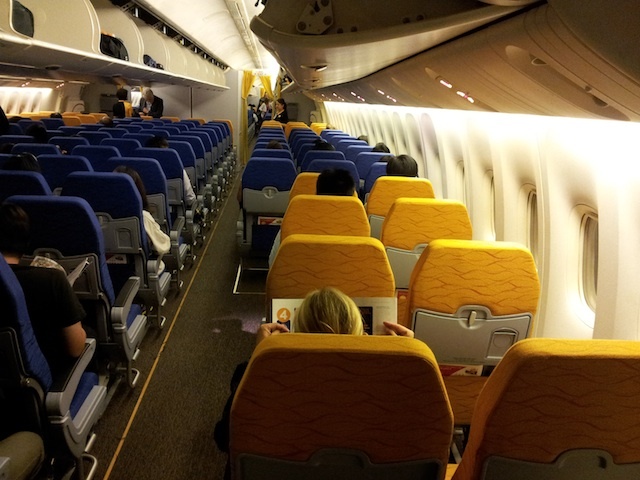 I counted 54 passengers in my cabin which I think seated 180. 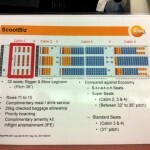 The airplane is configured with a 2-4-2 setup in ScootBiz and 3-4-3 in Economy except when you get all the way to the back few rows its 2-4-2 as the airplane tapers in that area. The seatmap at the counter shows an empty seat space between the seats, but that’s not the case onboard. 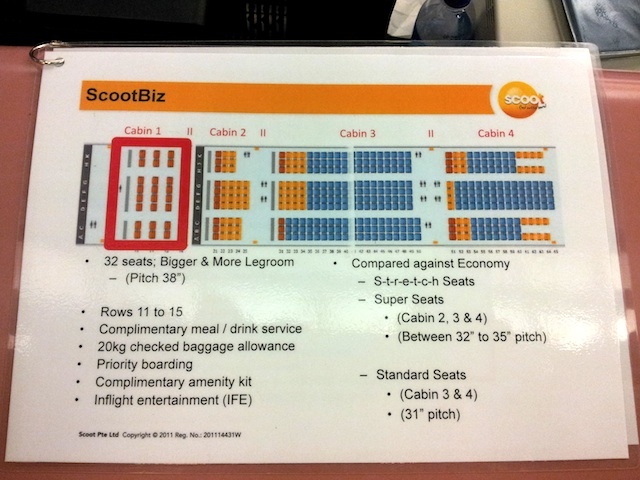 All the extra legroom seats that cost additional are yellow in color while all the other seats are blue except for the ScootBiz seats which are black leather with wings for the head. No such wings in Economy class. I was seated in one of the regular seats at the window and ended up having the entire row of three seats to myself as the flight was not very full. 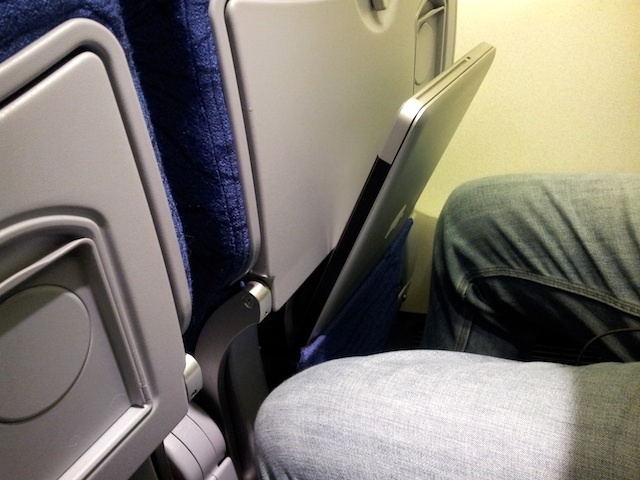 I actually had ample legroom, so not sure I’d pay for the extra legroom seat at all. The cabin is devoid of any In-flight Entertainment system. There are also no monitors anywhere to be found. I guess they are saving weight. The airplane holds 402 passengers and has only the bare minimum of nine flight attendants. We pushed back at 2:07a as the flight attendants did their manual demos. By 2:24a, we were airborne and bound for Sydney with flying time of 7:35. 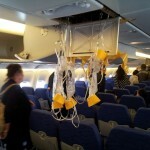 Apparently, just after takeoff, the oxygen mask at row 40 something popped open, so the flight attendants took sometime putting the five oxygen masks back under the cover and taping it up; the job was not well done as it kept popping open so eventually they left it; I guess they may have ran out of tape. 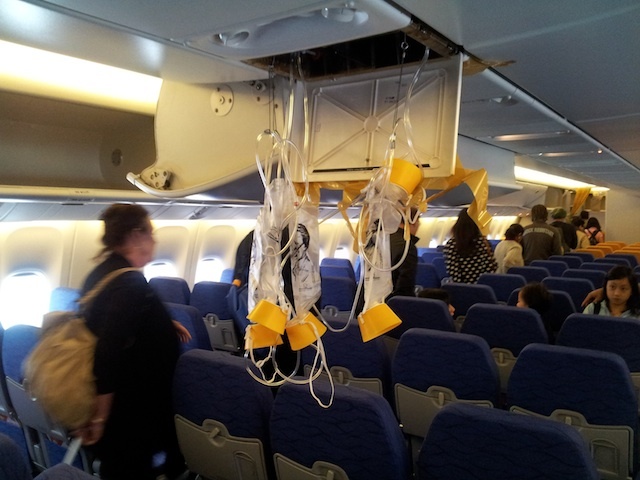 They did remove the passengers who were sitting there to the row behind it though. I did offer to help, but they refused my assistance. The flight attendants took almost an hour (3:13a) after takeoff to start the service and as it was a 2:10a departure most everyone wer e asleep including myself. So much so, that I had to go back to the galley to make my order of chicken biryani and a Singapore Sling for dinner. 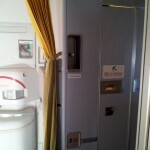 I did not get any kind of warmth from the flight attendants at all; they seemed to be just going through their paces. Maybe as it was so early in the morning/late at night, who knows. I thought the prices were pretty reasonable with the entrees being 10 SGD, beer was 5 SGD and snacks were also 3-5 SGD and a snack pack was 7 SGD. If you did the combo of entree, snack and a drink you only paid 17 SGD, I think you saved 1 SGD. They do not serve complimentary water from the carts, you have to buy a bottle or go to the two lavs with the water fountains attached i n the middle of the cabin where you can fill a cup or a bottle from a nozzle. There are signs not to drink the water from inside the lavs. The seat recline is pretty decent too, so is the seat width for a 3-4-3 configuration. Even with no one next to me, I did not feel cramped. I guess if I was sitting in the 4 seat section, I may have felt a bit different. The lack of wings did make it difficult to get some sleep as my head kept moving form side to side. Although I hate neck pillows one would have worked well. I tried to place my computer in the seatback, but to no avail as its too narrow, well not wide enough to hold the computer at all. 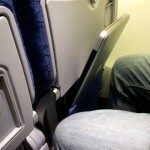 It did fit nicely on the chair table and had just enough room to be able to use it if the seat in front was reclined. The controls for the flight attendant and the light are both next to each other on the armrest. The cushions were not too thin and made for a comfortable seat and backrest. 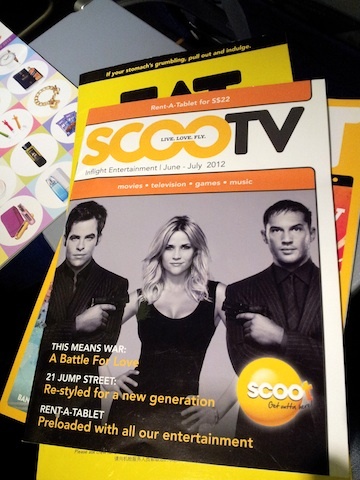 You can purchase an iPad loaded with the month’s movies/TV shows for 22 SGD. I did not bother to get one as I was way too tired and I had seen most of the programming. The few passengers onboard were also asleep or using their own device s. When I awoke later, there was quite a lot of activity as people were now awake and bored. 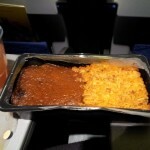 This seem to be the time when the flight attendants worked the most as people were now hungry and a bit restless. 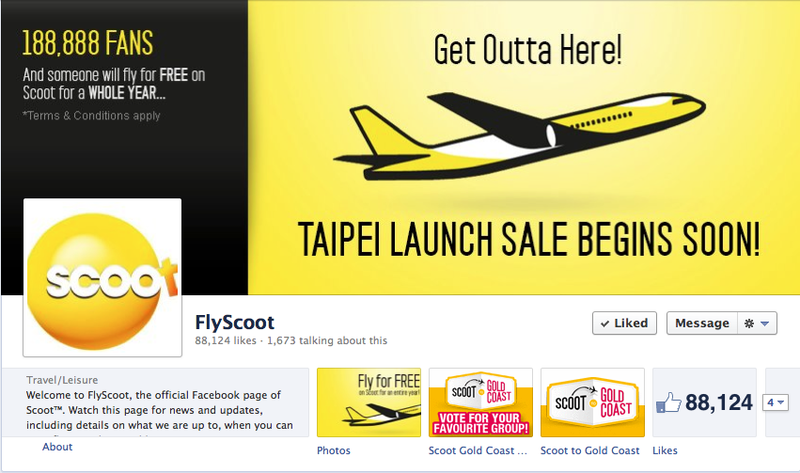 I think Scoot has a long way to go yet as they seemed to have concentrated on just saving money and providing a no-frills service and not much effort on the people side of things. 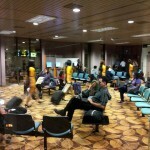 Nine flight attendants is inadequate for the service as its way too much strain on them to keep the passengers happy. 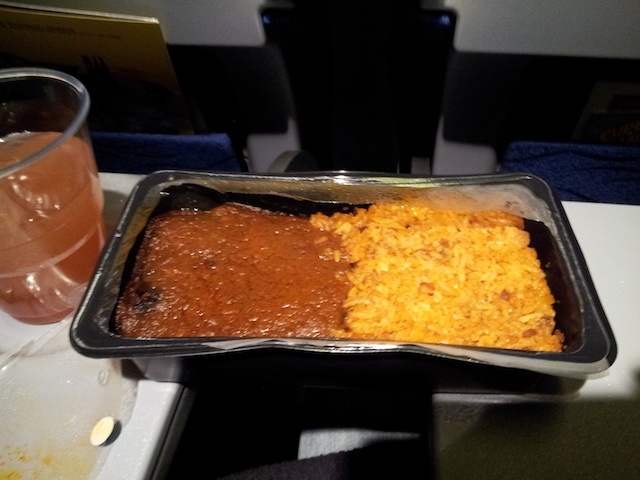 The flight was light and they still took a while to do the service. I’ll see what gives on my return flight. As such, my rating is a 2.5 airplanes out of 5. Have you flown Scoot? What was your experience like? Thank you Miguel. Have you flown them? I really liked your comments. I am thinking of trying out scoot and your comments really gave me a wonderful insight to your experience. Thanks. The pics are great. Thanks Agatha. They are worth trying. I always use Priceline, Hotwire, or Travelocity for my flhgits and hotels. I have flown domestically and internationally. Sometimes for international flight, going to a local (trusted) travel agent is better instead of searching online. If you live in a big city, near one, or in a suburban area, there should be one around.